Posted: Tue Feb 19, 2013 3:12 pm Post subject: What is this tractor? found this tractor for sale does anyone know what it is? I think it might be a CASE dont really know? Posted: Tue Feb 19, 2013 3:29 pm Post subject: Re: What is this tractor? Posted: Tue Feb 19, 2013 3:30 pm Post subject: Re: What is this tractor? Posted: Tue Feb 19, 2013 5:29 pm Post subject: Re: What is this tractor? Posted: Tue Feb 19, 2013 5:30 pm Post subject: Re: What is this tractor? Posted: Tue Feb 19, 2013 6:06 pm Post subject: Re: What is this tractor? The VAC 14 had a lower platform and steering wheel set lower. Posted: Tue Feb 19, 2013 6:49 pm Post subject: Re: What is this tractor? Posted: Thu Feb 21, 2013 4:08 am Post subject: Re: What is this tractor? Posted: Thu Feb 21, 2013 4:57 am Post subject: Re: What is this tractor? VAC Case with Eagle Hitch, missing fenders and drawbar. Posted: Thu Feb 21, 2013 4:41 pm Post subject: Re: What is this tractor? I have a late model VAC-14 and your tractor has the steering wheel set too high to match my tractor. So, I would guess your tractor is an earlier model VAC. You should be able to find the Model and serial number on a metal plate just under the steering wheel on the dash board, if it is still there. Posted: Sat Feb 23, 2013 5:09 pm Post subject: Re: What is this tractor? 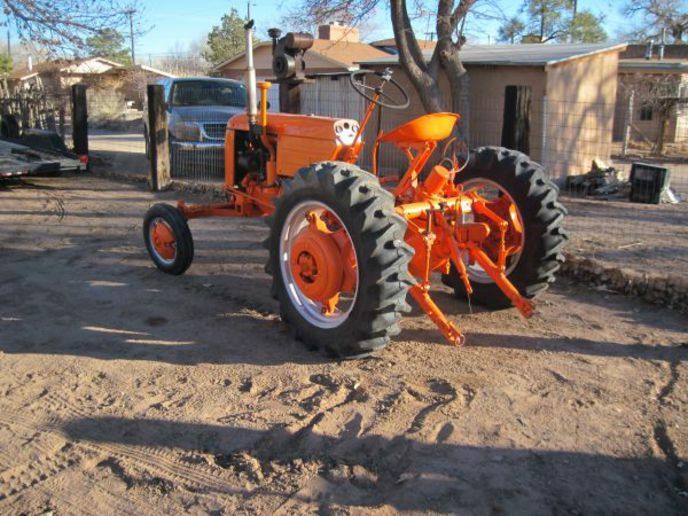 RICK Albuquerque, NM, Craigslist, Subject tractor then go to Feb 19th and it is still there for $1500.